Well I’ve been a bit more serious on this “Weight Gain Journey 2014”. My snacks started to bore me and that led to weight loss. Luckily in one of my online groups, someone reminded me of a nutritional drink I peeped months ago on the Conscious Box website. The Conscious Box is a healthy living subscription service that I’m subscribed to. 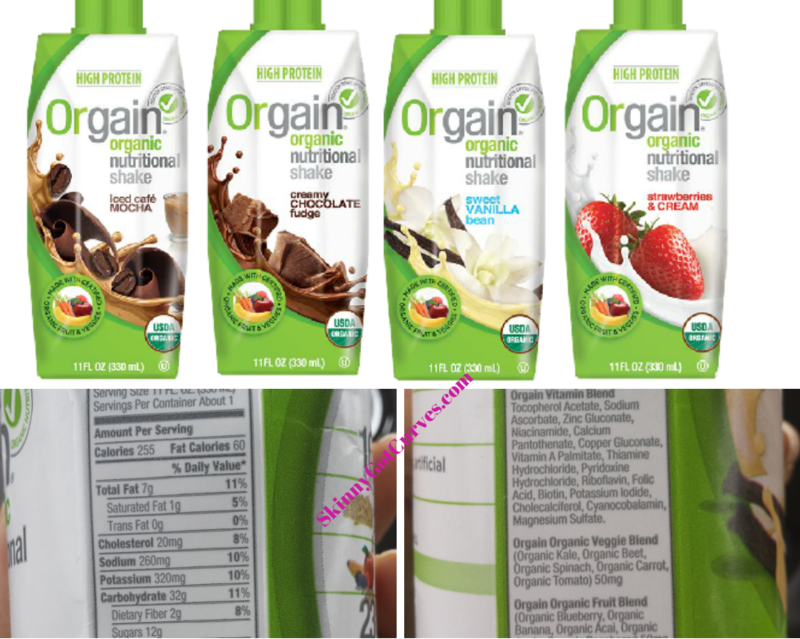 The young lady in my online group made me aware that Orgain Organic Nutritional Shakes are available in drugstores, organic supermarkets, & vitamin stores. I didn’t have any luck locating this product in drugstores or organic supermarkets BUT I did find them at the Vitamin Shoppe by the case and in singles. So far I have tried the Sweet Vanilla Bean and Iced Cafe Mocha. I love them both but I’m starting to crave the Iced Cafe Mocha now after I already purchased the Vanilla flavor in the case. Both are very sweet and it’s hard not to want to drink the entire bottle. There’s no medicine or healthy taste to it but thankfully it is good for you. It’s slightly higher in price than the Boost Plus Drinks and not as many calories BUT it is a HELL of a lot more healthier than Boost Plus. This drink contains green veggie blend such as Kale and Spinach that you can not taste. You will also find a fruit blend and vitamin blend within this one bottle. Boost Plus first three ingredients includes Corn Syrup and Sugar. There’s a serious difference between Orgain Organic Nutritional Shakes and Boost Plus, and I’m talking more serious than the price tag. I will use this drink as an add on to my calorie count rather than a substitute to my meals. Let’s be real, the price is too hefty to supplement for actual meals so it’s best used to easily get those calories in without killing yourself in corn syrup and processed sugars. Update: Orgain is now on AMAZON! YAY! That’s all for now folks. I just wanted you to be aware of this fairly new healthy snack and the entire Orgain Product line. This is the best of both worlds, Organic Nutritional Shakes. This will definitely be added to my weight gain food staple list. I temporarily stopped eating my staple snack items because I got tired of them but once I noticed the weight loss, I got over it quick. On a final note, for those curious to try this product and not trying to gain weight, this isn’t for weight gain only. Anyone can enjoy this drink but for us skinny people healthy high calorie drinks are a great alternative to put on pounds. Until next time – Love God. Love Yourself. Love Family. 2015 UPDATE: Orgain has expanded their lineup and can be purchased online too. You can go your nearest Vitamin Shoppe, WholeFoods or Amazon.